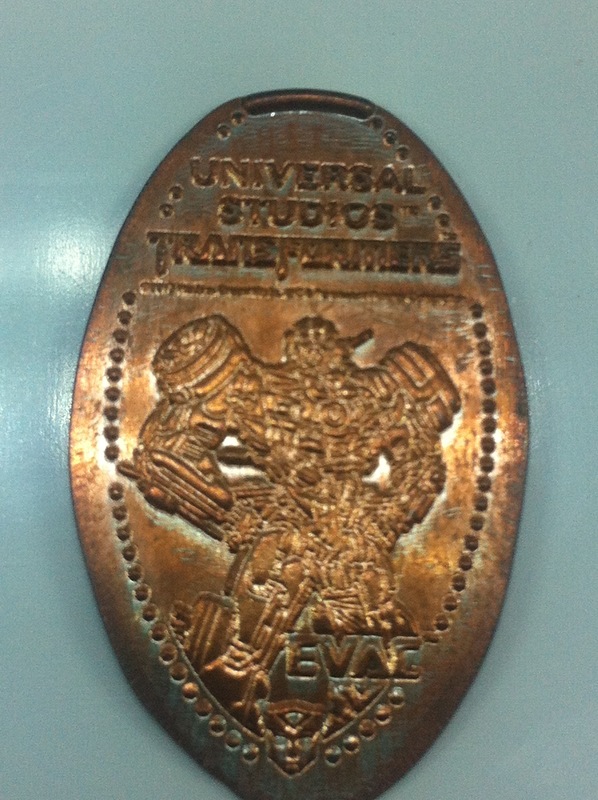 This week’s SATURDAY SIX takes a look at Six Great Souvenirs From the Universal Orlando Resort. 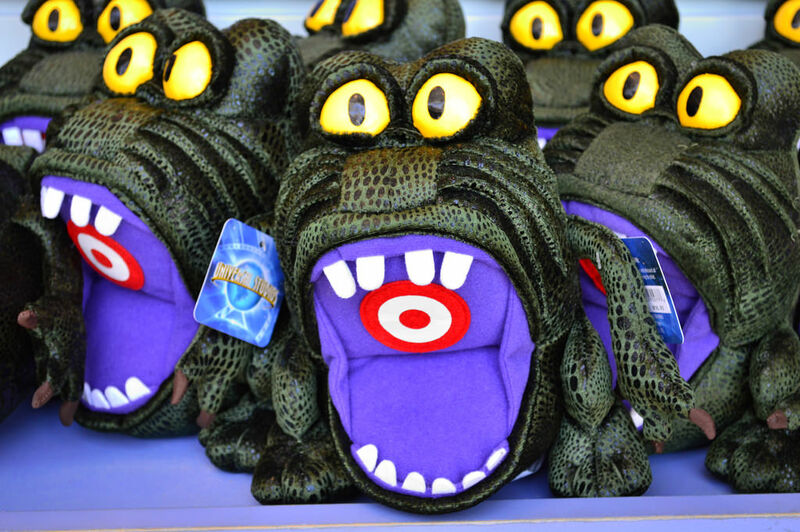 After two straight years of covering The Disney Outlet Stores each and every month for this fine blog, you can assume that we are pretty big fans of theme park merchandise (that or we did something awfully bad in a previous life). While exiting into a gift shop has become a running gag for many theme park guests, browsing those stores is actually something we here at the SATURDAY SIX offices look forward to almost as much as the rides themselves. No one has mercilessly attacked the world of theme parks with sharper wit than The Simpsons television show. One classic moment when they turned the screws on the parks we all love happened way back in 1994 with the episode “Itchy & Scratchy Land.” One of the more memorable gags from the show was Bart Simpson running into one of the most ubiquitous pieces of merchandise at any theme park, the gift with YOUR name of it. In this instance, Bart was looking at personalized mini-license plates and found the names Bert, and Bort. What happens after is even better but the capper comes later in the episode when it is revealed the park has sold out of Bort license plates. 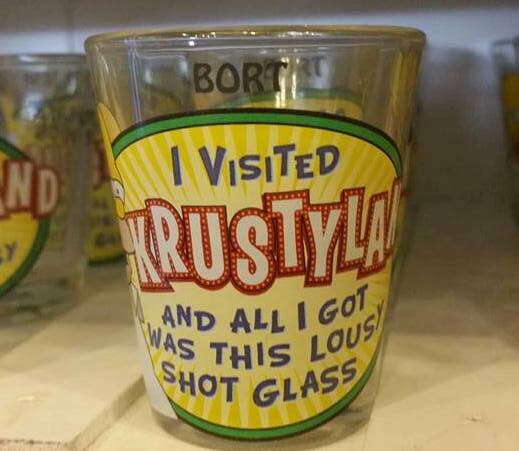 Universal’s own Springfield USA pays tribute to that classic moment with a Bort keychain found in the Kwik E Mart gift shop. 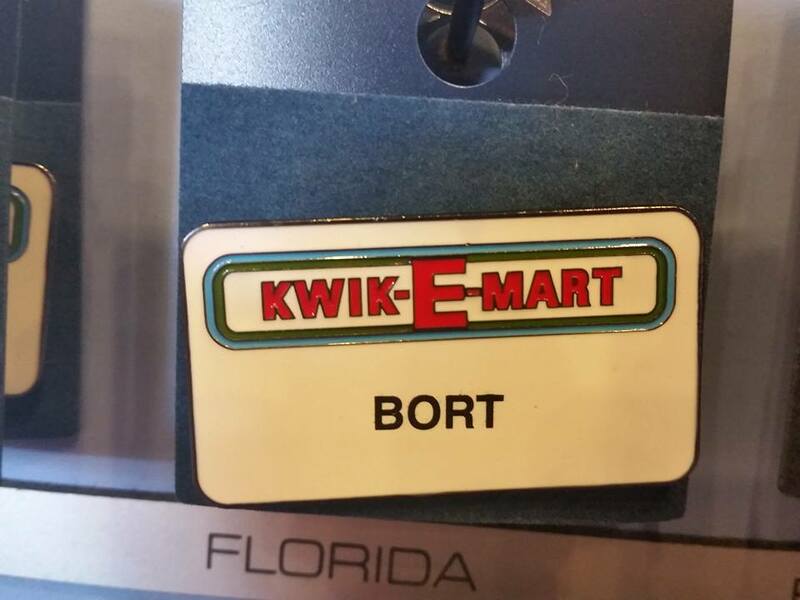 Bort keychain at the Kwik E Mart. 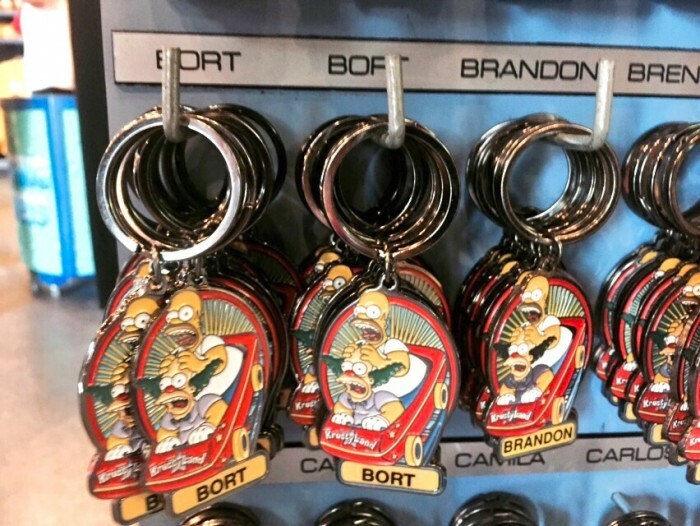 They even have more personalized items with Bort! Who can forget the, pardon the pun, magic of seeing the Harry Potter and the Sorcerer’s Stone for the first time? Like Harry himself, we Muggles were slowly introduced to a whole new world of wizardry. One of the first bits of true wonder came during Harry’s trip aboard the Hogwarts Express as he was introduced to a Chocolate Frog. Universal took this memorable moment of the film and recreated it for the parks, but then went even farther. 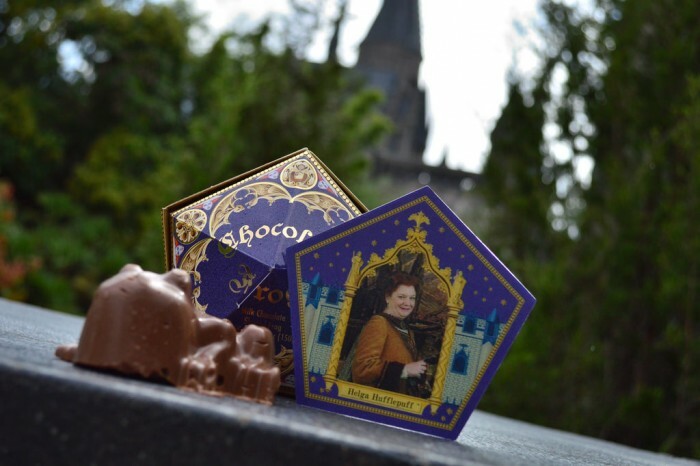 The Potter film explains that each Chocolate Frog comes with a Wizard Card, and so does each one at Universal. However, the Frog boxes at the parks come with cards randomly containing Dumbledore or one of the four founders of Hogwarts (Godric Gryffindor, Salazar Slytherin, Rowena Ravenclaw and Helga Hufflepuff.) 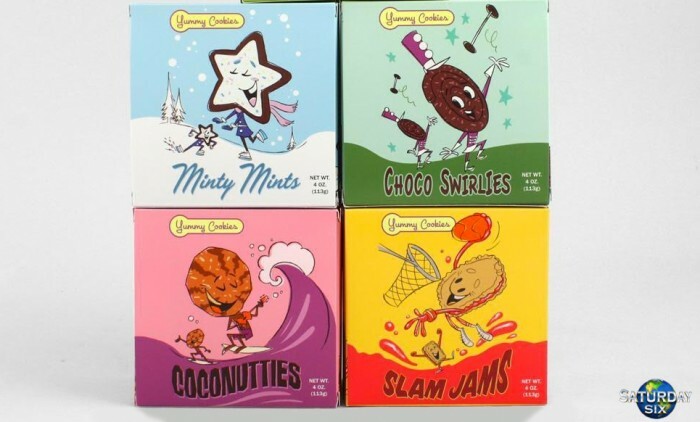 While the chocolate frog itself isn’t going to make Messrs. Hershery, Lindt or Cadbury lose sleep any time soon, the overall quality of the entire package is among the best on property and a perfect gift to buy for the Potter fan back at home. 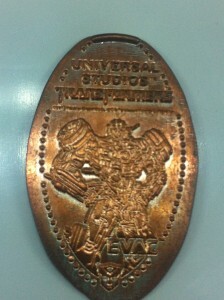 EVAC pressed penny. Transforms into 1/100th of a dollar. Take a stroll down any toy aisle at your local Target, WalMart or Toys R Us and you will find a section filled with Transformers action figures. After a huge resurgence in popularity thanks to the Michael Bay films, Transformers made the jump to the theme park world with Transformers: The Ride 3-D (a ride whose storyline is thankfully much easier to follow than any of the actual movies). The Supply Vault, the attraction’s gift shop, is filled with Transformers items including t-shirts, comic books, and key chains. 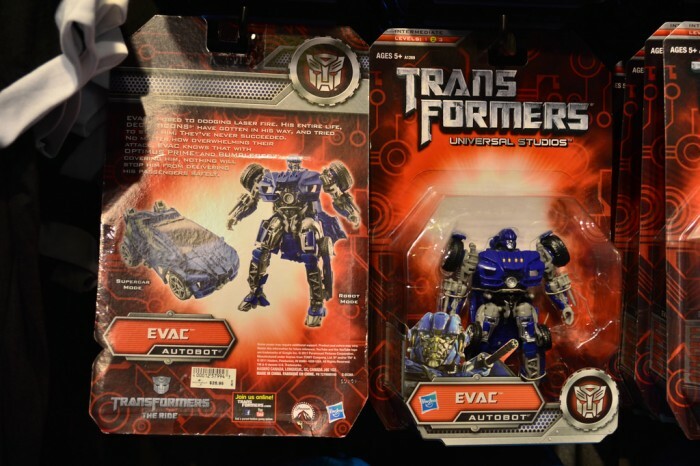 They also stock the Transformers action figures, including one that is ONLY available to purchase at Universal Studios: EVAC. The character EVAC is an Autobot (good guy) who is the guest’s ride vehicle during the attraction, but also transforms into a robot warrior. This is hands down one of the greatest pieces of synergy between a theme park and the toy world in history. And here is MY REVIEW of the action figure in which I had to watch two YouTube videos along with following the IKEA-like instruction manual on getting the figure to transform from a robot to a car. If the 10 Year Old version of me would have seen that he would have slapped me silly, and I would have deserved it. 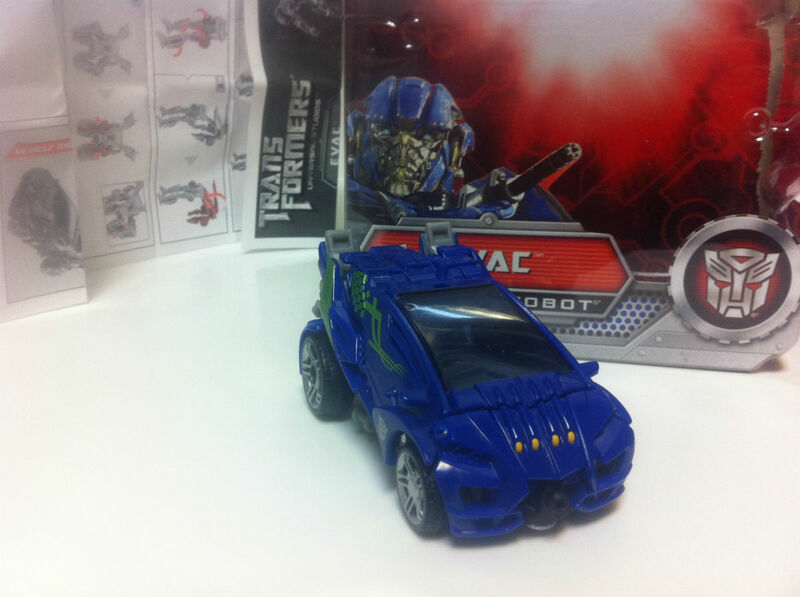 EVAC in car form, and it only took 40 man hours! 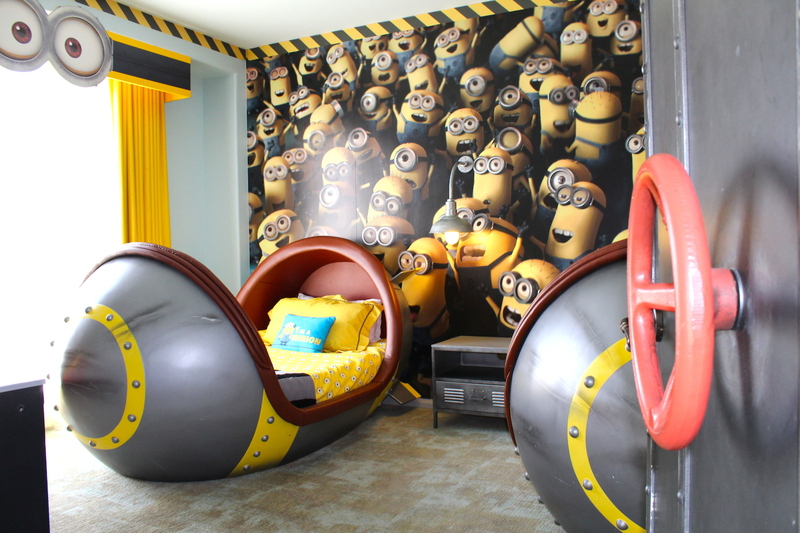 While the “IT’S SO FLUFFY!” unicorn plush and Minion fart gun are a couple of very memorable items from the Despicable Me film, the faux Girl Scout troupe that Gru’s daughters belong to – along with the cookies they sell – are much more involved with the overall plot of the movie. Universal has created some amazing looking boxes for these cookies that perfectly fit in with the whimsical nature of the ones seen in the film. 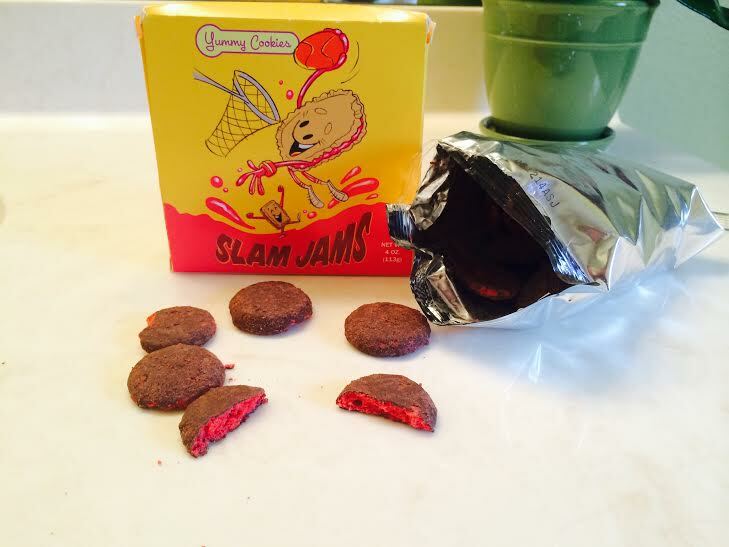 There’s also the little minor fact that these are actually good tasting cookies (our favorites are the Choco Swirlies and the Slam Jams). 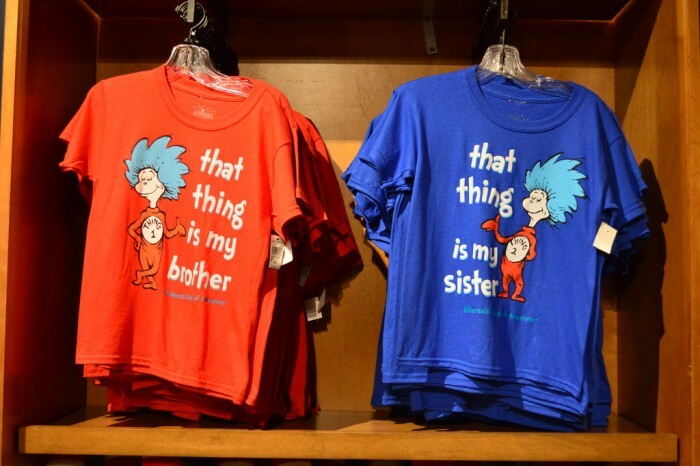 While Walt Disney World is synonymous (believe it or not I originally typed that as synonymouse) with merchandising, until recently the only item of note you could say was regularly bought at Universal was Thing 1 and Thing 2 t-shirts. 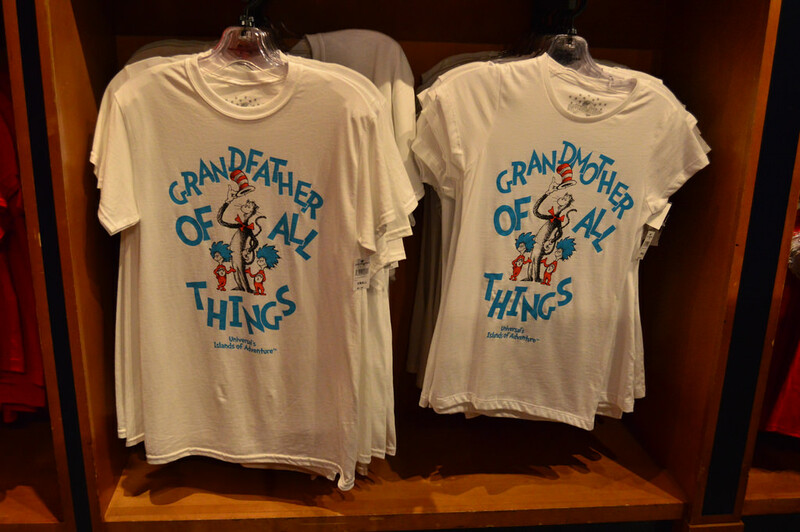 Disney fans would open up their wallets for pins, Vinylmations, Mickey Ears, shirts, plush and everything under the sun, but at Universal the one piece of merchandise you would see more than any other were these shirts spotlighting a trouble making duo from The Cat In The Hat. The shirts themselves are so insanely popular that they have spun off their own cottage industry including licensed ones at Universal along with a cascade of bootlegs. In a resort now filled with amazing merchandise, it’s hard to believe there can be a runaway leader for the top spot but here we are. 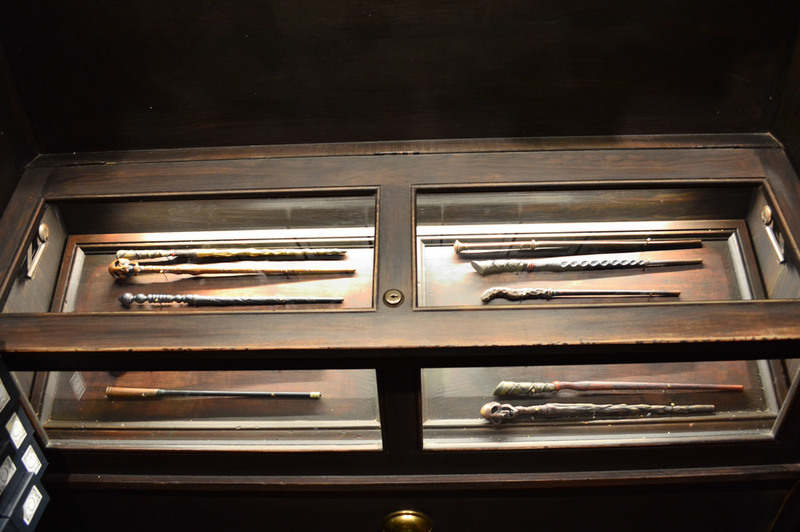 Wands in general, but especially Interactive Wands, are the greatest souvenir at the Universal parks. Why? Almost everyone who has read the Harry Potter books or has watched the movies has wanted a wand just like those of us who grew up with Star Wars wanted to wield a Jedi lightsaber or shoot Han Solo’s blaster. 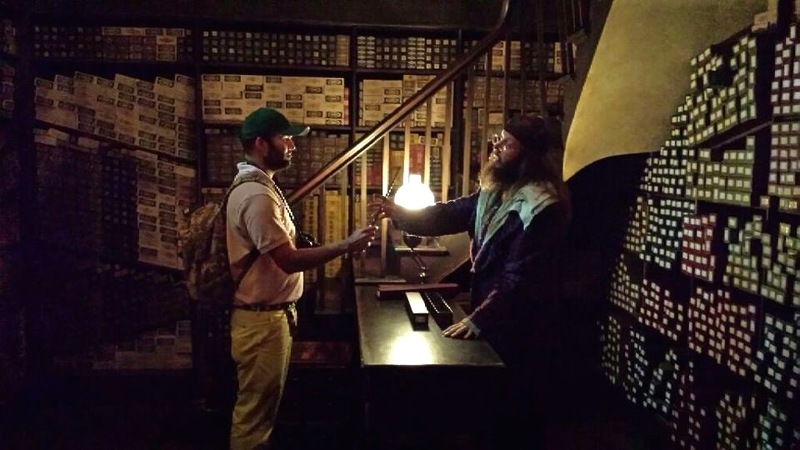 With the Ollivander’s wand experience, Universal has created such an amazing attraction that it compels a guest to buy a piece of merchandise, and they do so with a huge grin on their face! I have seen over two dozen wand experiences at Ollivander’s and while all have been good, some have been downright great. And when I say great, I mean that you are watching someone have a once-in-a-lifetime experience, many times one they have dreamed about. In a recent performance a young girl chosen was outright shaking during the show because she was so excited. You do not see this type of uncontrollable enthusiasm anywhere else on property (or at Disney for that matter). At the end of every Ollivander’s show, the guest chosen is asked to follow the assistant to discuss purchasing the wand, but I can not tell you how many times the guest holding the wand didn’t even want to let it go to give to the cashier. This was their wand. But that’s just half the story. While wands were already popular from the day Hogsmeade Village opened, Universal took it “up to 11” with the debut of Diagon Alley when it introduced Interactive Wands. Now guests can perform their own spells throughout both lands of the Wizarding World, and it’s a blast. So now you can have something you’ve always wanted, looks exactly like a prop from the films, and it can actually interact with real world elements. I may never get the working lightsaber I always dreamed of, but I can have a wand that casts spells. How cool is that? One of the newest pieces of merchandise to hit Universal has to get a spotlight because it features one of the park’s icons, King Kong. 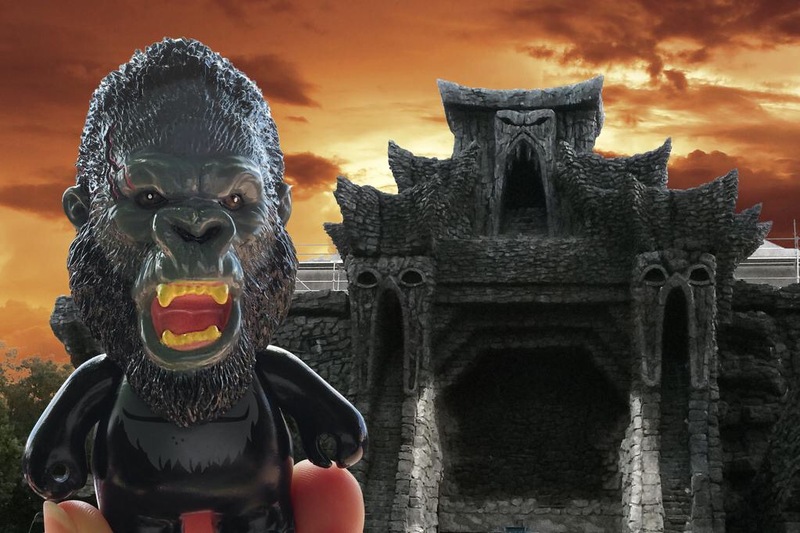 Ol’ banana breath comes back to the Florida parks soon with the Skull Island: Reign of Kong attraction at Islands of Adventure and there’s no better way to get ready for his triumphant return than with a Kong Uni-Mini. The Uni-Minis are very similar to Disney’s Vinylmation, and are easy to collect as they are small and relatively inexpensive. And if Jaws or Back to the Future had new merchandise they’d be here too. HINT HINT UNIVERSAL. There’s a good chance many people reading this – even the Universal fans – do not know this MIB: Alien Attack plush exists. We love it because it is so goofy and perfectly represents the fun guests have riding Men In Black: Alien Attack. Pound for pound the best shooter attraction in Florida, MIB uses physical props and recreates a very memorable moment in the first MIB film. While the MIB gift store is filed with items most casual fans of the MIB movies would recognize (Frank the pug dolls, neuralizers, cricket guns) this plush is our favorite item in the shop. 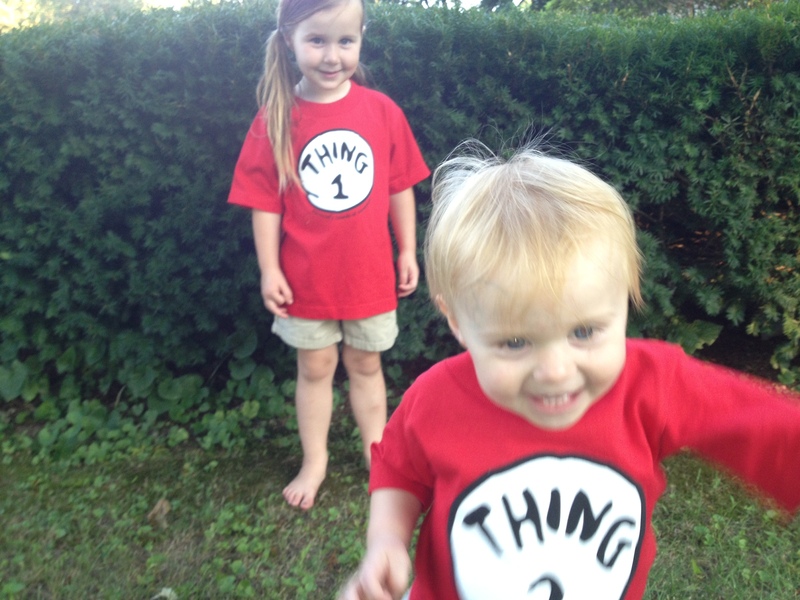 So how can you get these awesome pieces of merchandise? Three ways. 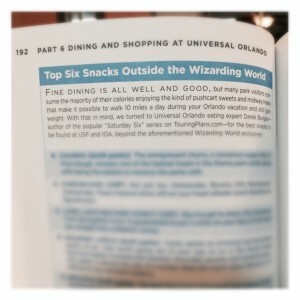 1) Go to the Universal Parks! This is by far and away the most fun way to get your hand on official park merchandise. 2) Go to Universal’s Online Merchandise Store. Here you can find a lot of park exclusive items, including a four pack of Chocolate Frogs that guarantees all four Hogwarts Founders. 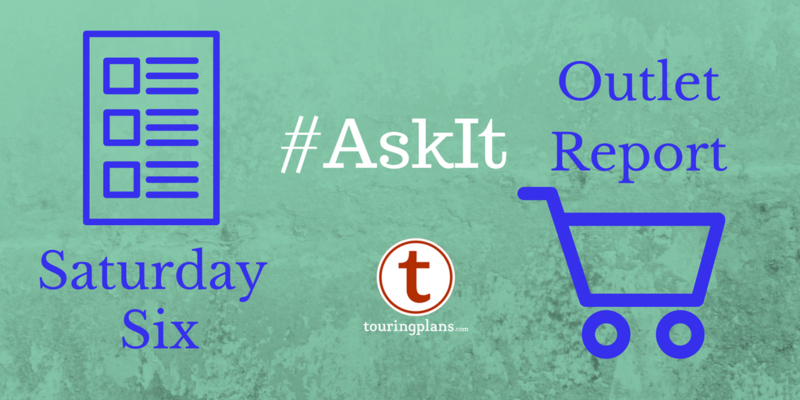 3) Use a theme park personal shopper. 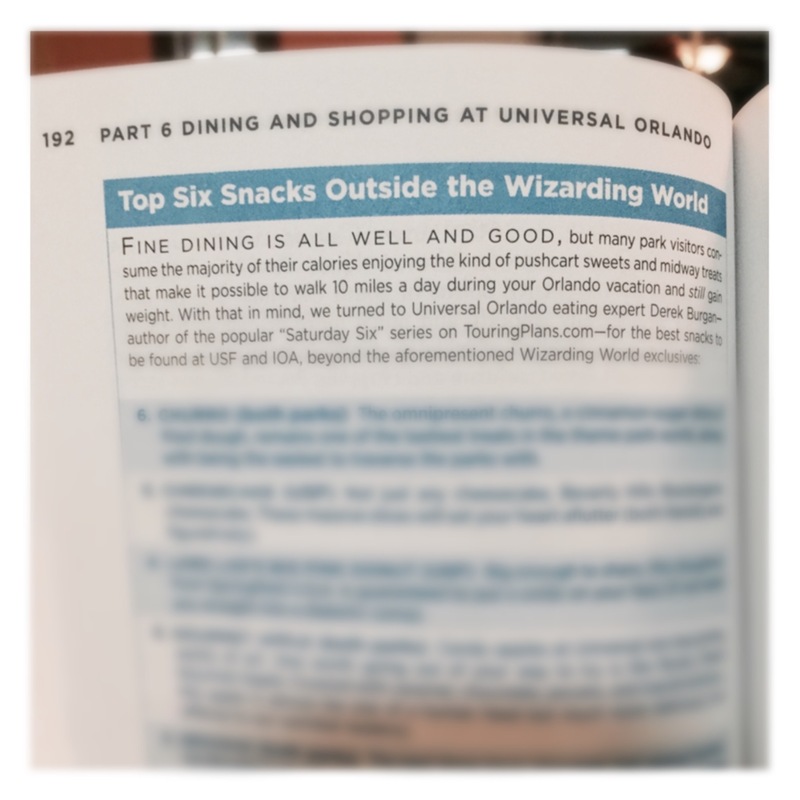 For Universal we recommend Hedgehog’s Corner. Personal shoppers can generally get almost any item you could possibly want from the parks outside of a Butterbeer. You can even do special requests such as a giant Lard Lad pink donut from Springfield USA or the next level bananas chocolate Allspark from Transformers The Ride 3-D.
A special SATURDAY SIX in book form! It’s true Dear Readers, IT’S TRUE! Follow link at end of article to purchase your own copy! Have bought many of these myself. Minor point, Duff Gardens predated Itchy and Scratchy Land. Good catch. That was another all time great episode. Adjusted description of the article. Thanks! When I visited Universal back in February, the Bort tags were entirely gone – not just sold out, not even a tag on the stand indicating where they would be. I have a feeling some merchandising manager didn’t get the joke and didn’t order more. Wow, I’ve seen them sold out (and it’s hilarious they actually two rows of Bort (at least now they do) but never gone completely. That picture was taken two weeks ago so thankfully someone regained their senses. Maybe I’m thinking of the Kwik-E-Mart employee nametags and not the keychains. Dean, updated article with the employee name tag and a shot glass. Pictures were taken this week so it’s safe to say they have put Bort across the store again. One glitch that the Simpson episode had was the PA announcement – “We are out of Bort license plates in the gift shop”. “THE” gift shop? As if there were only ONE? We all know that any self-respecting upper-tier theme park will have two or three gift shops within a dead cat’s throw. And each of them will have its own catchy name.